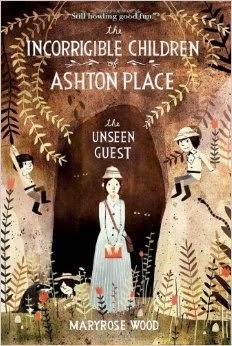 I just finished reading the third book in the Incorrigible Children of Ashton Place series, The Unseen Guest . Once again I was riveted to the book and enjoyed it immensely, with exception. This series follows the adventures of three extraordinary children : Alexander, Beowulf and Cassiopeia. These three children were found by Lord Ashton in the woods on his estate at Ashton place. He decides to bring the children home and hire a governess to care for the kids and to teach them how to behave in civilized society. Penelope Lumley, age 15 (by Book 3 she is 16) arrives on the scene and takes charge of the children, making headway in training them to behave more like humans and less like animals. A great many mysteries surrounds the children. Where are their parents? Why were they living in the woods? What experiences have they had in their young lives which they can use to help them renter the society of other people? Mysteries also surround Ms. Lumley who was raised in a home for poor, bright females and has no idea who her parents are or where they might be. Furthermore there are questions about the Ashton estate which seems to be shrouded in secrecy. We meet these characters and places in Book 1 (which I read and loved) and each follow-up book in the series reveals a few more clues as to how the children, Ms. Lumley, Lord Ashton and Ashton place are related (for you feel sure there is a connection)! These books are mysterious and fun. I'd probably recommend them to ages 9 and up. My oldest boy is 7 and I think he would probably enjoy these books as a read aloud at present but I'm fairly inclined to save them for his own independent reading. My "exception" to liking/recommending this series comes into play with this third title which does contain a séance which is performed so that the characters can call up the dead in hopes of answering some questions. The séance is contained into one chapter and is told in a humorous way meant to make the reader laugh. (Mind you, I didn't laugh but sped read the chapter.) I've previously explained why I don't really care to be reading about this type of magic so I'll refrain from repeating myself. This series of books is not as deeply seeped into magic as Harry Potter (or even Narnia) and I wouldn't say that this visit with the psychic is going to cause me to refrain from offering the read to my kids. I probably will let them read it and I suspect that they will greatly enjoy the story of these incorrigible children. I also plan on talking over the issue just as I will with Narnia magic and Harry Potter (should they ever ask me to read HP; I probably won't voluntarily promote Rowling). I LOVE this series! We listened to the first book on audio and were captivated by the reader. I felt the same way - love these books but didn't like that one aspect.